I'm new to this group and just thought I would give a small background as I'm now tossing around the idea of having another baby but obviously am quite scared. First pregnancy, bp elevated around 37 weeks, delivered with scheduled induction at 39.5 and all was well. Second pregnancy bp elevated around 38 weeks but not enough to warrant hospitalization or early delivery. If I recall it was usually around 130/90. I was induced at 39 weeks and sent home 2 days post delivery. I developed a terrible headache at 3 days pp so I went to the ER where they did a blood patch and gave me a bag of fluids. Bp wasn't great, 140-150/95 but they assumed it was from the headache. Discharged home. Day 6 pp I couldn't sleep as I couldn't lay down without becoming short of breath so I googled and was either a punctured lung or fluid in my lungs, I called my ob as I didn't want to go back to the ER for nothing and she told me to go in for fear of a blood clot. Ekg was normal but blood gas showed oxygen at 50% so a ct scan and chest X-ray were performed. Showed fluid in my lungs. Next an echocardiogram was done and showed my Ef at 50 and normal is 55-60. I was started on iv Lasix and admitted to the cardiac unit. Spent 3 days with a terrible headache but as soon as fluid was taken care of I could breathe better and headaches got better. No protein in my urine so they labeled it as post partum cardiomyopathy. I decided to have a third child because I love being a mother. I met with a cardiologist who did a cardiac Mri and saw no damage. Met with mfm group who gave the go ahead and said they thought it was unlikely that I had post partum cardiomyopathy but instead either fluid retention or post partum preeclampsia. All was well throughout the pregnancy until 36 weeks when my bp crept up again but would be up then down up then down. Again no protein in my urine. Had headaches but not terrible. 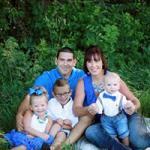 Experienced changes in vision but that happened with all 3 of my pregnancies. I was induced at 39 weeks and sent home as bp wasn't great but not awful, 140/90. I again started to have difficulty breathing around 4 days pp but gave it another day as it wasn't as bad as the pregnancy before. That night I couldn't sleep and decided to go to the ER in the morning. Chest X-ray showed fluid again so Lasix was administered. Bp was very high, 190/110 or higher so I was put on bp mess and mag sulfate for 24 hrs. Discharged home on bp mess and was able to get off of them by 6 weeks pp. it's been normal since. Sorry for the novel but I wanted to give some background. Have any of you had pp pre e more than once? What was your Drs take on it? How was your pregnancy handled? Did it return again? I asked my mfm before I was discharged if this meant no more babies and he said not necessarily as they would likely give bp meds and Lasix right after delivery. Anyway just looking for stories, experience, research, thoughts, etc. I so want to have another baby but also want to make sure I'm not putting my life in danger as I have 3 kids ages 5, 3 and almost 1. My plan is to meet with my mfm dr again before making any decisions to get his thoughts/what we could do. I also would like to wait a year or so before trying but not too long as I'm almost 33.